M97, the "Owl Nebula" imaged by Muir Evenden with a circled unidentified anomaly. One of the objects randomly imaged was the planetary nebula known as M97, the "Owl Nebula" in the constellation Ursa Major, the Great Bear. As Insight Observatory's Project Developer, Michael Petrasko, was post-processing the 300-second image originally acquired and processed by Systems Engineer, Muir Evenden, Michael noticed a smudge-like anomaly towards the lower right bottom of the image. The object had very similar characteristics to that of a comet. However, the object was yellowish in color and comets, for the most part, show up on images as bluish-green in color. As Michael zoomed into the image to get a closer look at the aberration, he saw many dim disk-like objects randomly scattered throughout. These objects were in fact galaxies. However, Michael could still not resolve what that blurry spot of light was in the frame even after being at full zoom. He then circled the object and forwarded it off to Muir for his consultation of what it may be. Screenshots of the galaxy cluster identified from the Aladin Deep Sky Atlas Software. Muir was also baffled by the oddity of light so he referenced the SIMBAD image database included in the Aladin Sky Atlas software. With this application, Muir could overlay one of his original luminance frames to determine if the object was in fact in the SIMBAD database of images for comparison. Identification of the blurry object was then confirmed by Muir using the software. The object was a small cluster of galaxies and when viewing an enhanced image of the object from the SIMBAD database, the single blurry object can be resolved as multiple galaxies. 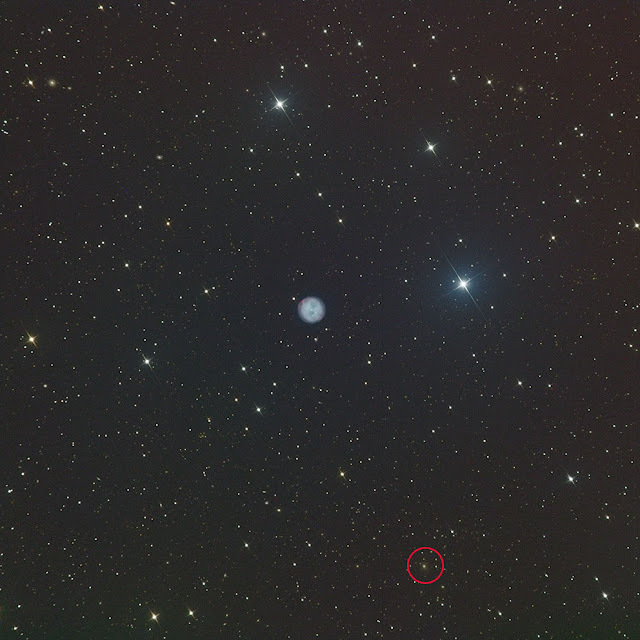 As students acquire images of common deep-sky objects, it would be good practice to task them with zooming in and panning around their images to look for other anomalies such as this one and attempt to identify them with an application such as the Aladin Sky Atlas. I think we're giving the Hubble Deep Field imaging-run, some competition!